I am thrilled to be speaking at #SQLSatATL again this year – it is has proven to be a great event every year! Register now! I will be presenting a session titled “Keys to Successful SharePoint Administration for the DBA” – the session’s focus is to get DBAs more comfortable interacting with the SharePoint platform and set them up for success when they are called upon to be an administrator, which happens quite often! Join me at #SQLSatATL on May 21, 2016 – if you see me, please stop and say hi! SQL Saturday Atlanta 2016 was a record year – 590 attendees were there to take in all the sessions! 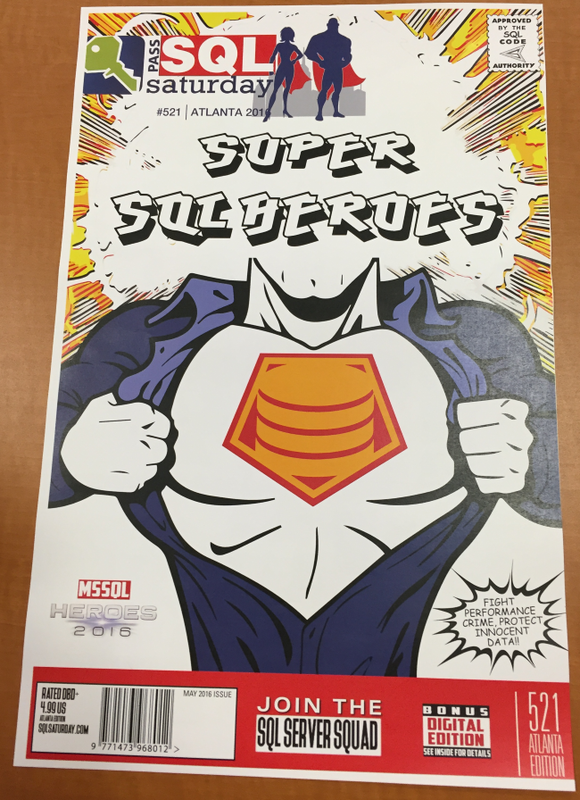 The theme for this year’s #SQLSatATL was ‘super heros’ and the speaker shirts were definitely in line with the theme. I presented first in the day and we had a great group of people, mostly database administrators, who wanted to know how to get a handle on being a SharePoint Administrator as well. They asked great questions and it was a lot of fun. The rest of the day was filled with a lot of learning and fun. Make sure to check out this great event next year!